I see your hope and optimism, your big dreams and courageous goals. I see your positive thinking, your ambition, your resolved commitment. This is going to be your year – for happiness, for financial security, for physical fitness, for love. I see you wishing all the best for the year ahead, for friends, for family, for strangers. I see it all, and I cheer you on, and I hope all good things for you, and for everyone. As for me, I’m stepping through this threshold a little more cautiously this year. Christmas, without my mom, was difficult but not as overwhelmingly painful as I’d feared. Then my aunt died that afternoon, and that brought fresh grief for my whole family. But the funeral, the time with family, the holiday gift-giving and celebrating – all of it was sweet. And my mom’s absence was so large that, in a way, it felt like its own presence. She was everywhere I looked. She loved Christmas and was an extravagant gift-giver, and I saw her in everything we did. The turn into the new year has been more difficult. I didn’t expect it, quite honestly. I was braced for the grief of Thanskgiving and Christmas, but not this. Part of it is the flood of memories of New Years Eve past, which we always celebrate with my parents. But more than that, I think, is the sense of how hard and strange it feels to be entering a new year without my mom. It’s like the turning of the calendar is taking me further away from her. What’s more, I am daunted by the realization that the new year may hold more unexpected losses and unforeseen grief. This time last year, I had no idea how hard 2015 would be, and how many losses it would contain. This is not to say that I don’t have my own big dreams and deep hopes for the coming year, because I definitely do. It’s just that I’m entering this year from a more tender, more vulnerable place than before. I’m more aware of my own fragility, of the fragility of everyone, of everything. This means I’m starting 2016 with less a sense of steely determination and more a sense of a soft heart. This feels like a good thing (even though it’s a hard thing), because it is giving me clarity about what really matters, about what lasts and what doesn’t, about what to hold lightly and what to embrace fiercely. And it is leading me to a more profound desire for real relationships, authentic selfhood, and a daily commitment to kindness and gentleness and compassion. I am writing this on my phone, from the road, which feels appropriate. Because I am on a journey – we all are – and even the best parts of it will pass. So will the hardest parts. I don’t know everywhere this road will lead, but I have a better sense of the kind of person I want to be as I travel. And I have a clarified commitment to be kind to fellow travelers. It could be that you, too, start this year from a place that doesn’t feel entirely celebrative or optimistic or determined. If so – I see you, too. I see you, and I hope you will be gentle with yourself, and kind. Is grief like a baby, in that once you hit the 3-month mark you stop counting time in weeks? I’m not sure if I can stop counting that way. Every Thursday marks another week without my mom, another week of getting further away from her death, further away from her life. Today it’s been 13 weeks. It has also been exactly three months. Am I ready to stop measuring time by weeks? I don’t know. I think I worked on it for another day or two at that point, and then put it back down again for a year. I guess when given a choice between cross-stitch and knitting, I always pick knitting. I just need to finish the snow and then I get to do the deer. The strange thing is, as easy as cross-stitch is, I have found the stitching lately to be very slow-going, especially those white stitches. I feel clumsy and slow and frustrated. It gives me lots of time to think and to breathe. Despite some of the frustration involved, I’m going to keep going this time. The progress is painstaking, but, as is often the case with my crafting, it is reminding me that, if I just keep stitching, no matter how slowly, eventually something beautiful will emerge. I am choosing to keep believing that this will be the case with grief, as well. It is painfully slow stitching, y’all, and I can’t see the whole design of it from this point. But I trust it will yield its gifts, its wisdom, and its beauty, if I persist. It’s amazing to me how grief and gratitude can both occupy so much space – at the very same time – in my heart. This day has been full in the best possible way and also hard – I have wanted so many times to call my mother, to ask the most basic questions (how long do you heat a spiral-sliced ham? I don’t want to know what the Internet says, I want to know the way my mom does it), and give her the full report (I finally did everything right to get the Bundt cake to pop out of the pan perfectly and intact! I did a buffet line this time instead of putting all the food on the table, and it worked so much better! Charlie was so happy we had ham in addition to turkey – just like you, he likes ham much better than turkey. ), and also let her know how wonderful it was to have my dad and brother at the table for the first time in 15 years even though it just emphasized for all of us all over again how she is gone and everything has changed. 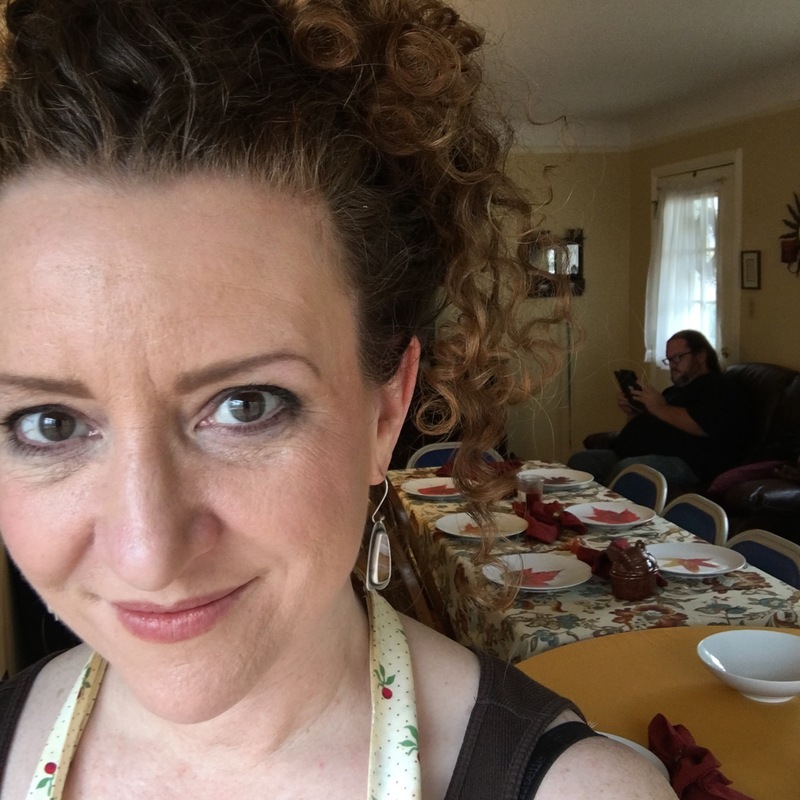 There’s been a lot of missing her today (which is true every day) but also so much gratitude – for her; for all she taught me (about cooking and hosting and mothering and so much more); for my entire family; for the amazing honor of feeding 13 people. And I’m so grateful for you, too. My virtual community is more than virtual – it is a real support for me, a net of kindness and care during this difficult time, and I am grateful. I tried to make you a little video of me saying thank you, but I looked far too earnest and also a little bit teary (which I honestly wasn’t). So instead, you get this goofy time lapse video, of me feeling all the feels and trying to show my love. Thank you for being my people. Happy Thanksgiving! Once in a blue moon, I write a post exactly when I intended to write it. This is not that time. I’ve been trying to write this post for three months. I’ve written a little about the difficult summer my family went through this year, which culminated devastatingly in the sudden, unexpected death of my mother 10 weeks ago. As horrible as losing her has been, things actually could have been even worse. Because a little more than a month before my mom died, my father almost died. It’s a long and unusual story that I don’t have the emotional energy (or hand dexterity) to tell now. 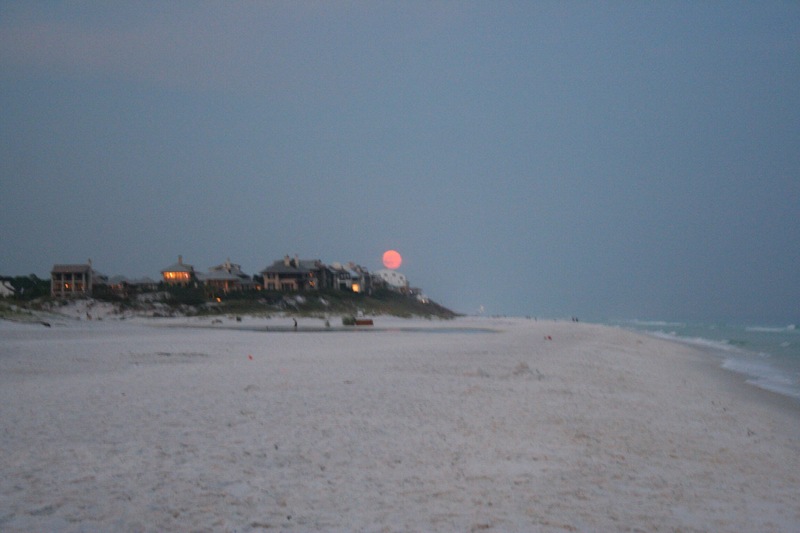 But the upshot is that, on the evening of July 29, I found myself speeding up the road from the panhandle of Florida (where I had been vacationing with my husband, kids, and husband’s kids) to Atlanta, where my dad was being rushed (from a hospital two hours away) for emergency surgery for an aortic dissection that had gone undetected for 10 days. I made it to his bedside literally five minutes before he was wheeled away (at 12:45am), and my brother and I spent a fretful night alone in the waiting room, calling our mom with updates (my mom, a paraplegic, was unable to travel to be there herself). At 6:30 the next morning, the surgeon came to tell us that not only had the surgery been successful, but it looked like my dad might regain kidney function (he had been in kidney failure for several days at that point and, going into the surgery, we thought the best outcome was that they would save his life and he would be on life-long dialysis). To get to see my dad awake, alert, and okay following the harrowing events of the previous several days was one of the happiest experiences of my life. A blue moon, that happened to be orange. It felt to me like a harbinger of hope. My heart felt exactly like that moon – big and luminous. We went back to the beach house and, later that night, I cast on for something out of some handspun I had finished a week earlier. 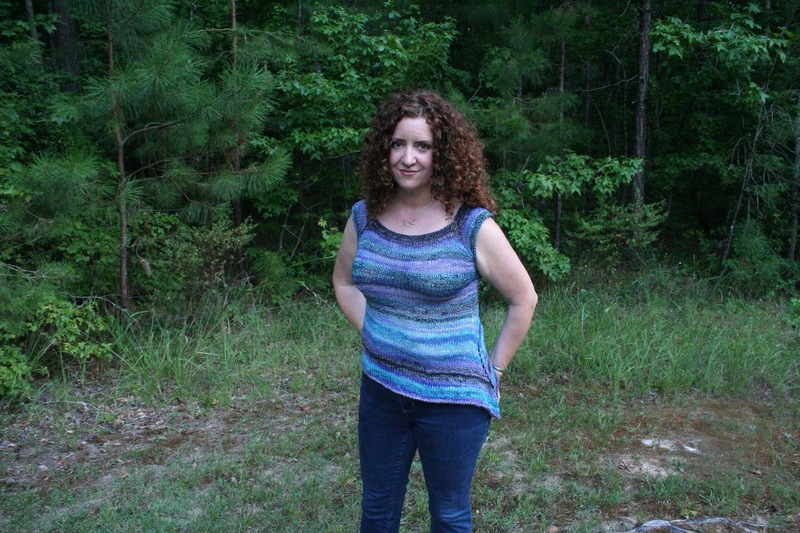 It was the first I’d been able to knit in days, and I did it out of such a sense of joy and relief. And though it was only four ounces, I decided to attempt something I thought might be impossible – an adult-sized top. I just cast on and went for it. We went from the beach back to Georgia, where I enjoyed more time with my mom (while my dad continued to recover in the hospital). There is so much conversation with my mom knit into these stitches. And the knitting just breezed by – I finished in three days. It was my last completed project that my mom got to see. 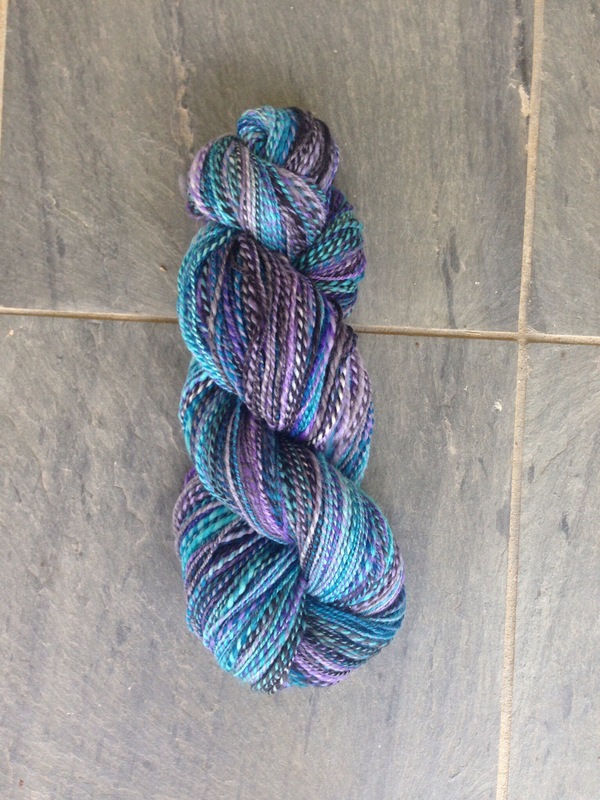 Once in a blue moon, fiber goes from bag to wheel to needles to body in a flash. And then, the day after I took the modeled shots, I got to drive back to Atlanta and pick my father up. He was discharged and sent home, not only having survived the aortic dissection and emergency surgery, but having unexpectedly recovered full kidney function. Once in a blue moon, the impossible thing becomes possible, and life happens where death was meant to be, and celebration and relief take the place of fear and grief. When I tried on this piece, I was disappointed, as I often am. I had to finish knitting before i wanted it to be done, because I only had so much yarn. So it’s shorter than I’d prefer. And the stress of this summer took its toll on me. so I’m also heavier than I’d prefer. Even so, I put the thing on and went out in the Georgia heat to take pictures. 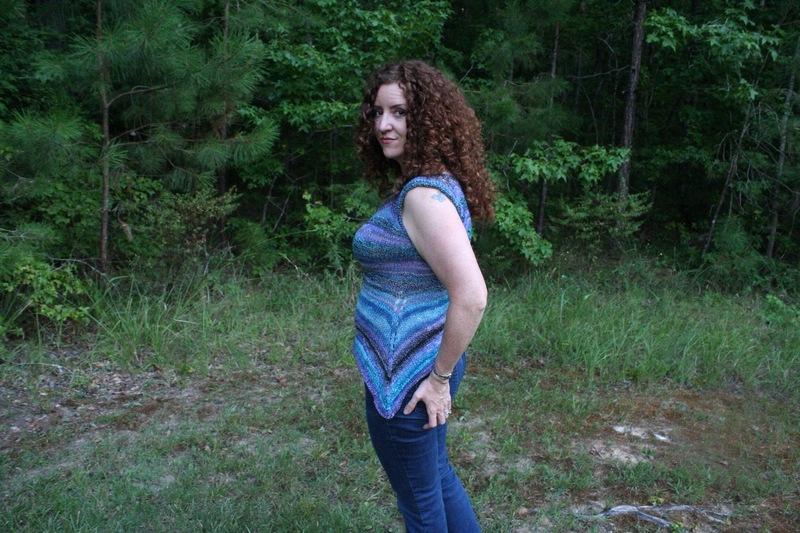 The pattern is called the Rosa Cardi (I don’t know why, because there’s no cardiganized version). 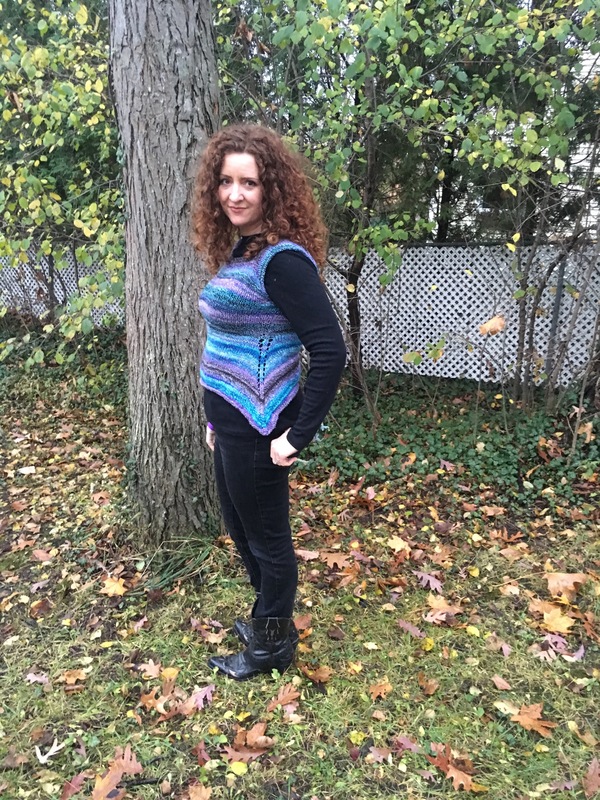 As originally written, it has points on both sides of the hem, but many people have knit it with just one point, which is obviously what I did, too. 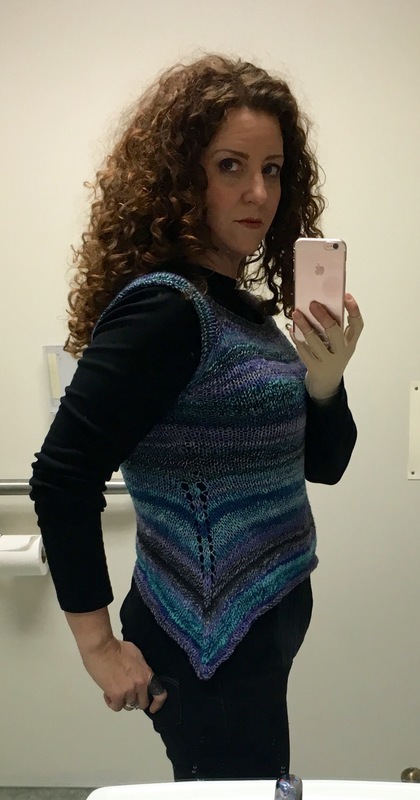 I really like this fast and easy pattern a lot, even though it may not currently be the most flattering piece I own. It is really fun to knit, and I think it’s cute in handspun. But I’m very unlikely to wear it without something underneath it (and in fact, I think it’s intended as a layering piece). So after these photos, I put it away for awhile. Then my life slid sideways and I kind of forgot about it altogether. 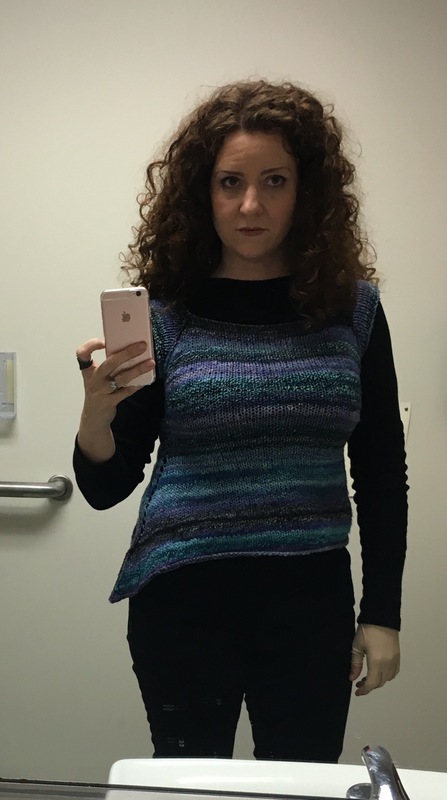 Then a few weeks ago, I saw it in my closet, and I felt a lot of pain, remembering how happy my mom and I were during the time I made this sweater, and how hopeful. I wasn’t sure if I’d ever feel like wearing it. But this week, I did. The day I had to go to the orthopedist about my hand, I suddenly felt an unexpected and very strong desire to wear the sweater. So I put it on, over a long-sleeved t-shirt, and I wore it to the doctor’s office. And despite the look on my face, I was really pleased to be wearing it, and actually got multiple compliments. I like it a lot better as a layering piece, and I already have plans for making another. When I got out of the doctor’s office with my new splint, my very first impulse was to call my mom. Which is not much different from every other day, honestly. So that was hard. But there’s something about wearing this sweater – and I know this sounds woo-woo or mystical or maudlin or whatever – but … I mean, there’s a piece of her in it. Her happiness, as we celebrated my dad’s remarkable survival; her companionship, as we watched baseball and true crime; her encouragement, as she saw me model it; her love, which stills wraps me up, and covers me. Once in a blue moon, something that was too painful to do (like wearing this sweater) becomes an unexpected door to some kind of solace (like feeling her love when I wear it), and the difficult becomes good, and the stitches become some kind of healing.